Room light Front (map light) The lights are turned ON or OFF by pressing the corresponding switch. Center (dome light) ➀ DOOR : The light turns on or off when a door is opened or closed. The interior light goes out slowly if the door is closed. When a door is unlocked by the transmitter, the interior light stays on for 30 seconds as long as the door is not opened. ➁ ON : The light turns on and stays on even when the doors are all closed. ➂ OFF : In the OFF position, the light stays off at all times, even when a door is open. 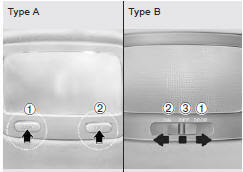 Cargo area lamp (if equipped) The cargo area lamp comes ON when the rear hatch or rear hatch window are opened.